Algorithm is a set of rules that precisely defines a sequence of operations. Algorithms can perform calculation, data processing, and automated reasoning tasks. Algorithms can be classified by implementation, design paradigm, optimization problems, field of study, and complexity. 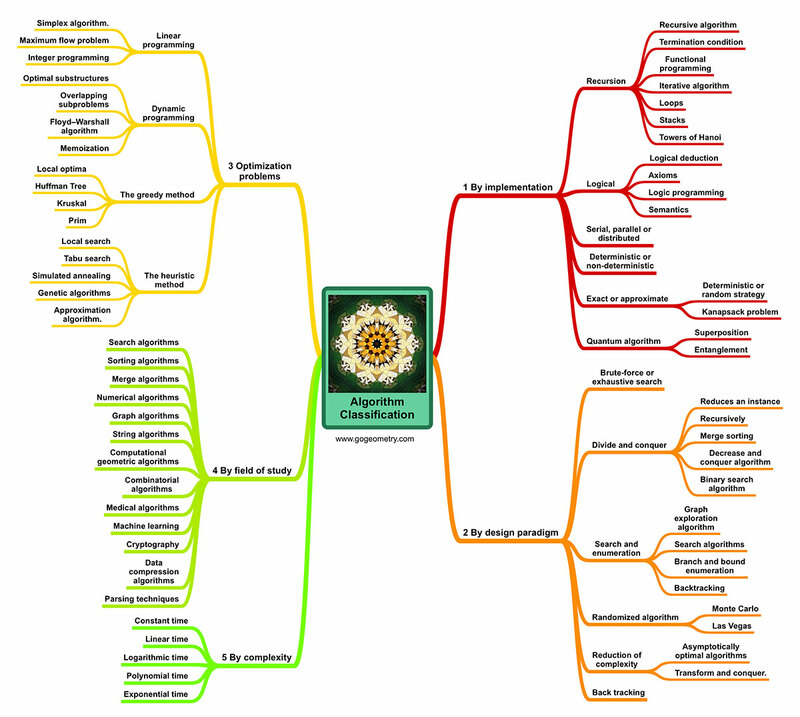 Mind map based on Wikipedia: Algorithm as of February 2, 2019. Graph showing how the words algorithm, implementation, design, paradigm, optimization problems, field, study, and complexity have occurred in a corpus of English books over the selected years (1800 - Dec 2008). Google Books Ngram Viewer is an online search engine that displays a graph showing the frequencies of any set of comma-delimited search strings found in a corpus of books printed between 1800 and 2008.